Click on the icon above to download a paper on a condenser absorber used on a sludge dryer wet scrubber system. 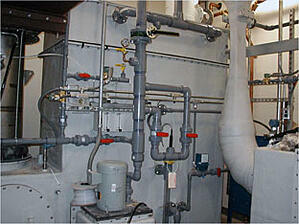 The Condenser/Absorber sub-cools and scrubs acids from the gas. Reducing the gas volume through condensation of the water vapor significantly lowers energy requirements. Also, heavy metals such as mercury, lead and cadmium are condensed for collection. The Condenser/Absorber condenses out more than eighty percent of the flue gas moisture. The result is a nearly invisible stack plume under most atmospheric conditions. Stack gas reheat may be added to eliminate the white steam plume for all atmospheric conditions.